Today we think of the Erie Canal as a pleasant linear recreation park we get to play in every summer. It’s hardly a hidden gem given its notoriety (I mean, besides The Erie Canal Song, there are at least five other folk songs about it4). We cannot, however, understate the power of the canal. Just as Joseph Ellicott had earlier predicted, the Canal would spur both economic and population growth into and around the Greater Western New York Region. And as we’ll discover in a later chapter, its early life led to a dramatic national cultural phenomenon. But you’ll have to wait for that story. The Niagara Escarpment is not only responsible for the Niagara Falls, but also for the Genesee Falls in Rochester. While these wonders of nature certainly merit the awe they’ve received, it’s the man-made waterfall created by the Erie Canal in the town of Lockport that we honor in this chapter. 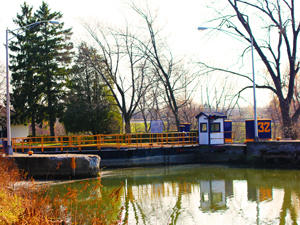 The Niagara Escarpment presented a never-before-seen engineering challenge for Canal builders. Somehow, they needed to devise a method for moving the water up and down the sixty foot drop caused by the Escarpment. Nathan Roberts came up with the idea of a dual set of five locks, considered by many at the time (and even today) an engineering marvel.8 Visiting America to celebrate our country’s 50th birthday in 1825, the French General Marquis de Lafayette, after seeing Niagara Falls, went out of his way to travel to Lockport’s famous “Flight of Five” locks and said, “Lockport and Niagara County contain the greatest natural (Niagara Falls) and artificial (Lockport Locks) wonders, second only to the wonders of freedom and equal rights.”9 Within a decade after his visit, Asher Torrance, owner of a Lockport foundry, and Washington Hunt, a lawyer and future governor, had the idea of reversing Lafayette’s path to direct some of the thousands of Canal passengers on a twenty-three mile detour to become America’s first tourists10, but we’ve already covered the consequences of that in our chapter on Niagara Falls. During the construction of Roberts’ locks, contractors bored the first tunnel through the Mesozoic rock, ostensibly to carry surplus canal water.10 More than a generation later in the 1850’s, Birdsill Holly, inventor of the fire hydrant, central steam heat and the rotary pump, blasted the 1,600 foot Hydraulic Tunnel through the literally rock sold limestone.11 The tunnel used natural gravity to create a water race that powered adjacent industries. Once you emerge from the tunnel, your journey continues as the boat passes under the widest bridge (399’) in the United States and then – my favorite – the legendary “upside-down” railroad bridge.13 It’s not really upside down, it just looks that way. It’s really a deck truss bridge – itself a less well used but still very viable form of the more popular truss bridge. The reason why you don’t see deck truss bridges too often is because they require an awful lot of space beneath the bridge – space not usually available. Thanks to the Niagara Escarpment, that space comes in plentiful supply. Unless, perhaps, if you’re traveling by boat. And just as the “upside-down” bridge symbolized the railroad’s eventual dominance over the canal, so do we move into this past future in the next chapter.